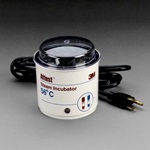 3M Attest Incubator provides optimal incubation conditions for the accurate readout of 3M Attest biological indicators. Since the growth of each test organism is temperature dependent, it is critical that the appropriate Attest biological indicator be used with the correct Attest incubator. 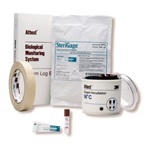 Complete biological indicator test packs that includes everything needed for the monitoring of the steam sterilization process. For clinics, medical, and veterinary offices. The Centers for Disease Control and Prevention and AAMI recommend a weekly biological indicator challenge of all sterilizers. 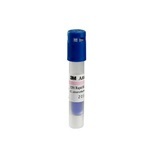 Various brand biological indicators provide the best assurance of sterility by challenging the steam sterilizer with quantifiable, highly resistant Geobacillus stearothermophilus spores and providing results quickly. 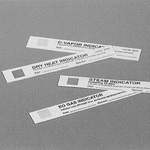 These class 4 steam indicator strips have a distinctive, color change feature when exposed to steam sterilization. Ranges in size and colors. 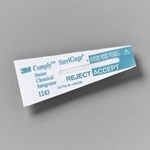 These class 5 steam indicator strips have a distinctive, color change and accept/reject features when exposed to steam sterilization. Ranges in size and colors. Dry heat indicator strip that measures 4" in length and are made from paper. 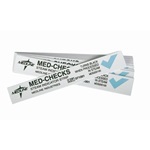 Disposable, nonsterile, latex-free strips. 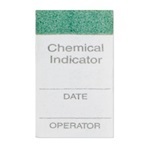 Each chemical indicator label provides distinct color change when exposed to the sterilization process. Has date and operator fields on label. Pressure-sensitive indicator for use in dry-heat sterilization processes. 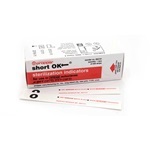 OK Steam Sterilization Strips are indicators that monitor all critical sterilization parameters: steam, time, and temperature. In sterilization cycles, OK strips guard against incomplete steam penetration, presence of non-condensing gases or excessive air, as well as from inadequate temperature or insufficient time exposure. 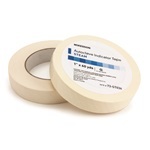 Surgical instrument sterilization tape is used to seal sterilization packs or wraps. The tape will visually indicate that the pack has been exposed to the steam sterilization cycle by its distinctive, non-reversible color change from beige to black. Lead-free ink means no hazardous waste issues.